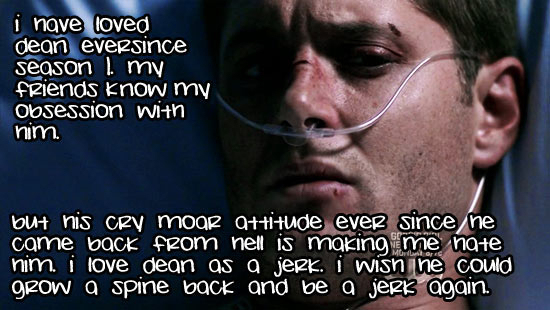 A weekly posting of anonymous Supernatural fandom-related secrets. Welcome to the first all-Supernatural secrets community. This is a friendly environment to share secrets within the fandom anonymously through images and discussion. Please see the userinfo and FAQ post for more information. Secrets Left to Post: 0 secrets from Secret Submission Post #111. Secrets From fandomsecrets: 13 from 4/17 - 4/30 not including any 'not secret' or repeats. Secrets Not Posted: [ 0 - broken links/not loading ], [ 1 - okay! ], [ 1 - not!secrets ], [ 0 - not!SPN-related ], [ 0 - too big ], [ 0 - repeat ], [ 0 - update ], [ 0 - direct link please]. Suggestions, comments, and concerns should go here. If it is a pressing issue, please do not contact mods in their personal journals or in the comments here. Please leave a direct link to your image secret here. Comments screened, anonymous commenting allowed. Make sure to check the rules and guidelines before submitting. If you have more than one secret, be sure to post each in a separate comment. Secrets are posted approximately one week apart. Flocked content is permitted as long as it does not contain obviously identifying information: names, photos, icons, etc. It remains subject to removal at the request of the owner. Secrets Left to Post: 0 secrets from Secret Submission Post #110. Secrets From fandomsecrets: (All) 12 from 4/3 - 4/16 not including any 'not secret' or repeats. Secrets Not Posted: [ 0 - broken links/not loading ], [ 0 - not!secrets ], [ 0 - not!SPN-related ], [ 0 - too big ], [ 1 - repeat ], [ 0 - update ], [ 0 - direct link please]. Secrets Left to Post: 0 secrets from Secret Submission Post #109. Secrets From fandomsecrets: (All) 12 from 3/20 - 4/2 not including any 'not secret' or repeats. Secrets Not Posted: [ 0 - broken links/not loading ], [ 1 - not!secrets ], [ 0 - not!SPN-related ], [ 0 - too big ], [ 1 2 - repeat ], [ 0 - update ], [ 0 - direct link please]. Secrets Left to Post: 0 secrets from Secret Submission Post #108. Secrets From fandomsecrets: (All) 17 from 3/6 - 3/19 not including any 'not secret' or repeats. Secrets Not Posted: [ 0 - broken links/not loading ], [ 0 - not!secrets ], [ 0 - not!SPN-related ], [ 0 - too big ], [ 1 2 - repeat ], [ 0 - update ], [ 0 - direct link please]. Secrets Left to Post: 0 secrets from Secret Submission Post #107. Secrets From fandomsecrets: (All) 18 from 2/20 - 3/5 not including any 'not secret' or repeats. Secrets Not Posted: [ 0 - broken links/not loading ], [ 0 - not!secrets ], [ 0 - not!SPN-related ], [ 0 - too big ], [ 0 - repeat ], [ 0 - update ], [ 0 - direct link please]. Secrets Left to Post: 0 secrets from Secret Submission Post #106. Secrets From fandomsecrets: 19 from 2/6 - 2/19 not including any 'not secret' or repeats. Secrets Left to Post: 0 secrets from Secret Submission Post #105. Secrets From fandomsecrets: 21 from 1/23 - 2/5 not including any 'not secret' or repeats. Secrets Not Posted: [ 1 - unreadable ], [ 0 - broken links/not loading ], [ 0 - not!secrets ], [ 0 - not!SPN-related ], [ 0 - too big ], [ 0 - repeat ], [ 0 - update ], [ 0 - direct link please]. Secrets Left to Post: 0 secrets from Secret Submission Post #104. Secrets From fandomsecrets: (All) 32 from 1/9 - 1/22 not including any 'not secret' or repeats. Secrets Left to Post: 0 secrets from Secret Submission Post #103. Secrets From fandomsecrets: 24 from 12/26 - 1/8 not including any 'not secret' or repeats.